So remember that amazingly good chicken salad from Rachel’s baby shower that I promised you?? Well the wait is over. Get excited! 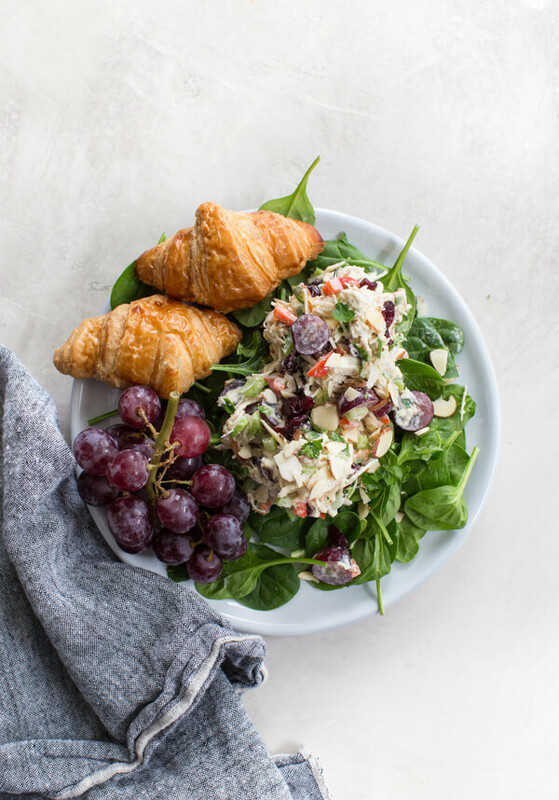 Chicken salad is one of our go-tos during the week because I can make a big batch of it on the weekend which makes for easy lunch prep. 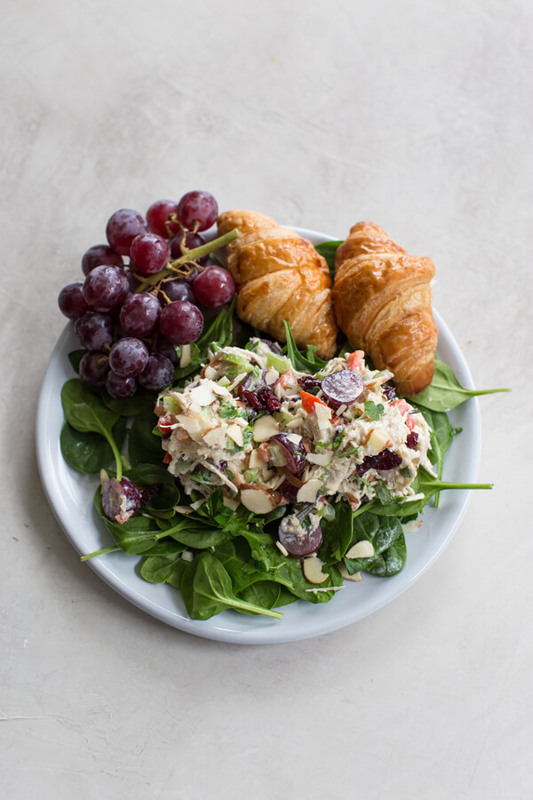 I’m going to let you in on my two secrets for the best chicken salad – are you ready? You guys. This lemon yogurt is the stuff. But not just any lemon yogurt works either, trust me. I’ve tried them all. You’ve got to have the creamiest yogurt and lemonyest yogurt for this chicken salad and I think by far the Liberte Lemon Yogurt is the bomb, or opt for any higher fat lemon greek yogurt. 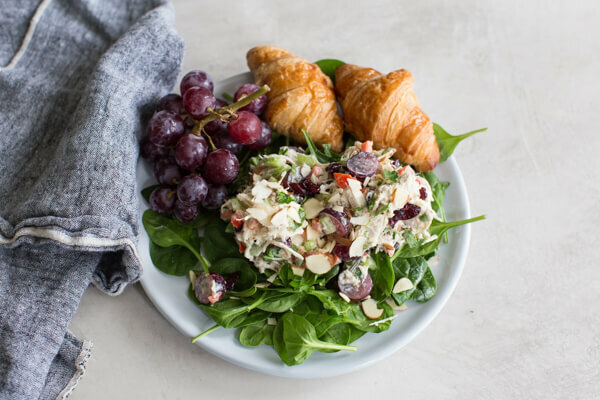 How to make chicken salad with grapes? 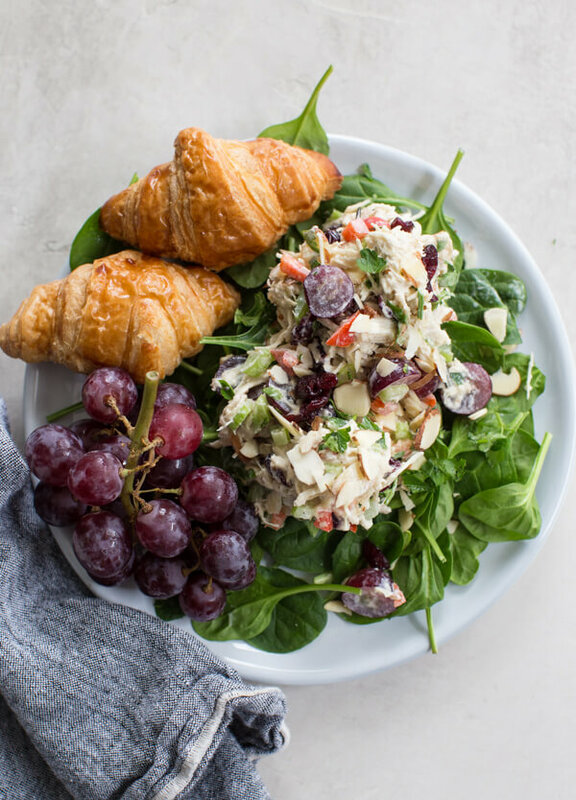 Grapes are a game changer in chicken salad because they add the perfect amount of sweetness to a creamy chicken salad and the flavor combo is one that you need to try for yourself. 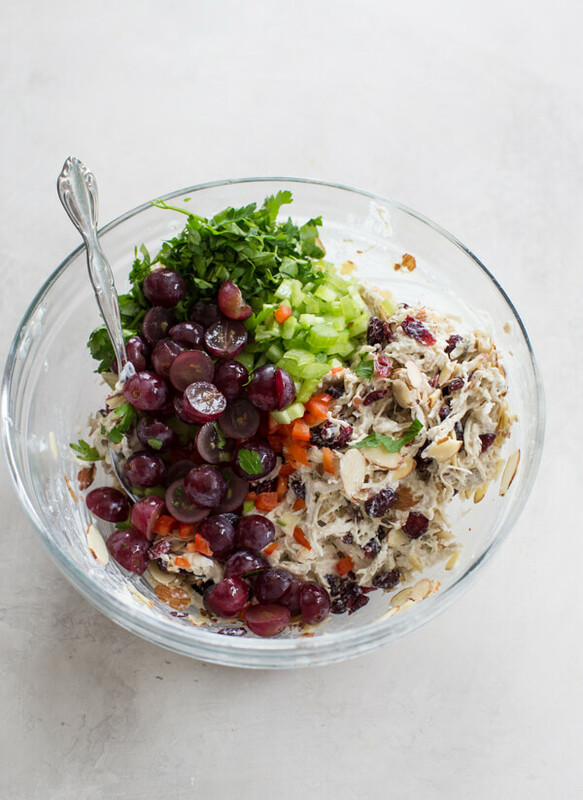 If you enjoy chunky chicken salad, leave the grapes whole. For this recipe, I suggest cutting the grapes in half so you basically get the sweet grape flavor in every bite! Is chicken salad bad for you? 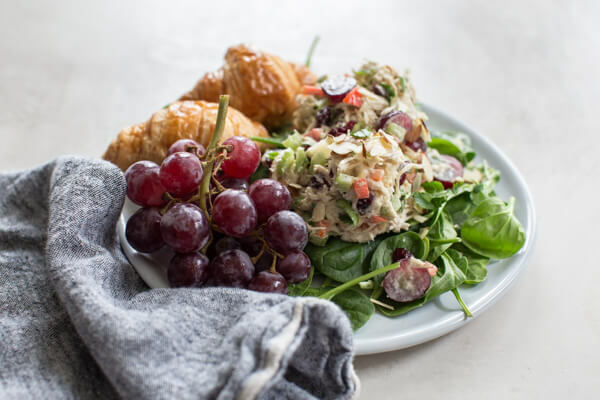 One of my favorite ways to serve chicken salad is wrapped up in a fluffy croissant. A warm a fluffy croissant stuffed with creamy chicken salad… currently drooling! 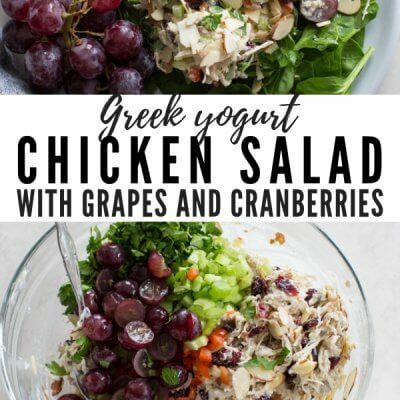 You can also serve this Greek yogurt chicken salad with grapes and cranberries over a bed of leafy greens – my personal fav is spinach or spring mix! For baby and bridal showers, I will serve mini croissants and greens on the side so that everyone can build their own. What can you substitute for mayo in chicken salad? Greek yogurt!! Try this Liberte Classique Lemon Yogurt that’s seriously to. die. for. This is not an exaggeration, friends! You’ll never want mayo in your chicken salad again because its so dang tasty and adds a top notch flavor to this chicken salad recipe. Can you use rotisserie chicken in chicken salad? Absolutely! Rotisserie chicken adds great flavor to chicken salad and is also a time saver in the kitchen if you’re in a pinch. 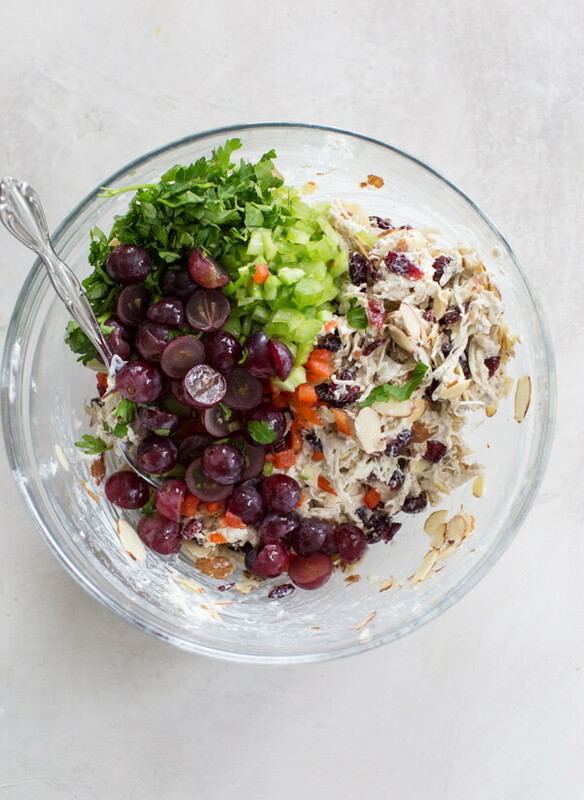 Simply pull/shred the rotisserie chicken and mix with the rest of the chicken salad ingredients! I wouldn’t suggest freezing this chicken salad recipe. The crunchy veggies and grapes are not the best candidates for freezing and might become soggy upon thawing. However, this chicken salad recipe is good for up to 1 week in the fridge! It’s a great option for a healthy lunch meal prep. But you CAN freeze shredded chicken! So keep that on hand for even easier chicken salad making. Oh, and another quick tip for this recipe – pack it as a sandwich for your little one’s lunches! Such a great and delicious way to sneak more fruit and veggies in your kiddos tummies. 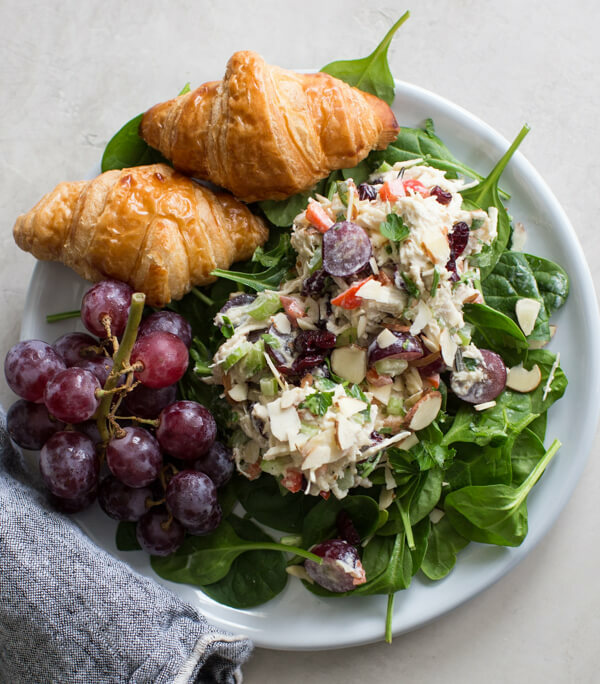 Spoon this chicken salad between two slices of bread and voila! A nutritious and healthy lunch meal prep that everyone will love. 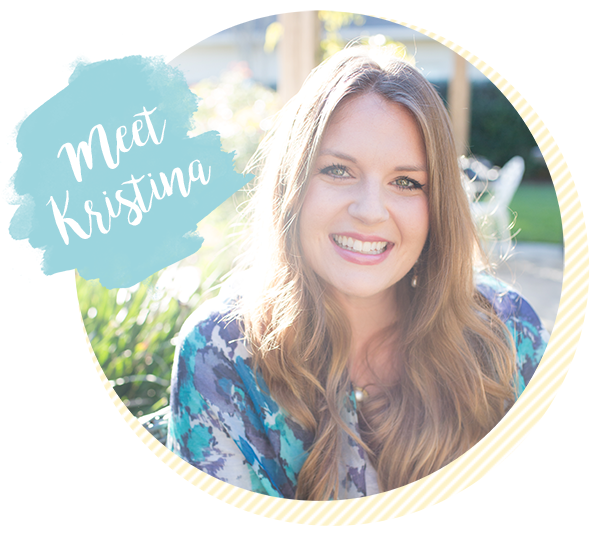 Hi, I just wanted to say that I am so glad I came across your site! 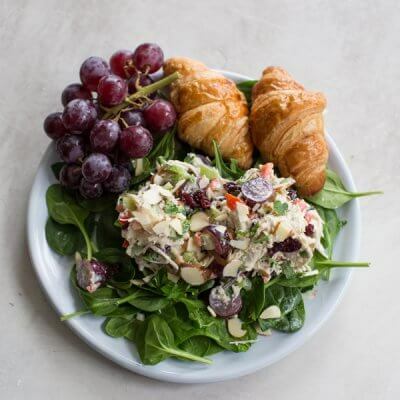 I discovered it last week and have already made two of your recipes, this chicken salad was so delicious, I might just need to buy another Liberte Lemon Yogurt to whip up another batch. thanks so much for all you do!! This is awesome! I’m really excited to hear that you enjoyed the chicken salad. Thanks for leaving this sweet note, made my day! How did you get the Liberte yogurt? I didn’t see a place to order on the website and the do not distribute to stores in my area. I’d love to try the recipe they way you make it, it looks outstanding, and i love chicken salad! hmmmm… I get mine at Publix. 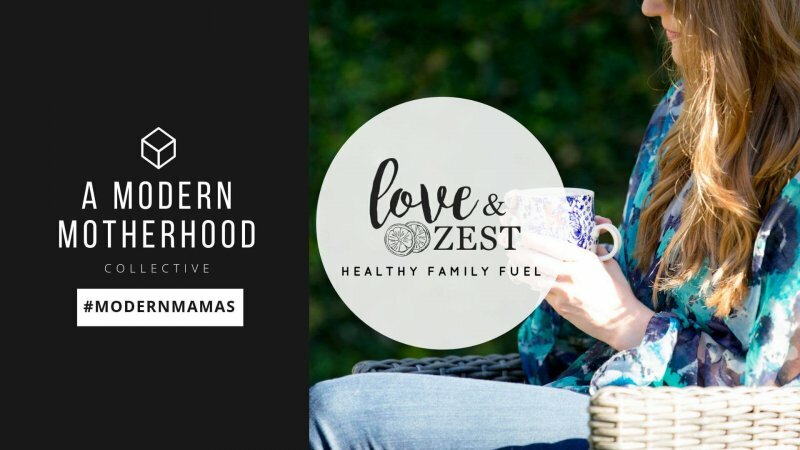 :/ I know I just talked up the yogurt in this post, but I’ve made the recipe with other brands too. I’ve noticed the Liberte is the creamiest because of the fat content but you could do a whole milk or 2% lemon yogurt. I’ll see if I can find another solution for you 🙂 Hang tight. I emailed them and they said you can find Liberte in Whole Foods and Natural Co-Ops too. Thank you for following up for me! I will check the local Whole foods or try a whole milk or 2% lemon yogurt. 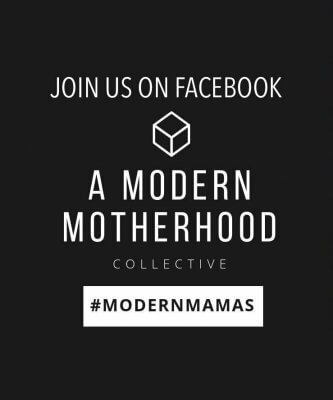 Just found the site recently and really like it! Do you think I could just add lemon juice to yogurt? I don’t like sugar content in flavored yogurts!